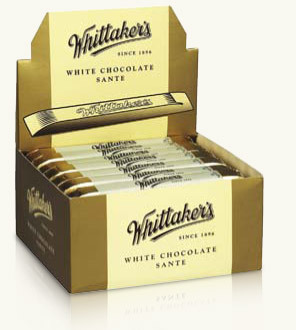 Whittaker's Chocolate is sold throughout all supermarkets in NZ and also through the Route Trade which includes wholesalers, oil stations and most dairies nationwide. Our main competitors in NZ are large multinationals including Cadbury, Nestle, Mars and Lindt. We are a strong number two in the New Zealand chocolate market, Cadbury is the market leader. 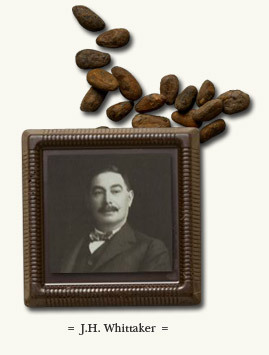 Whittaker's was founded in 1896 by James Henry Whittaker, who had immigrated to New Zealand from Macclesfield, England. James Henry began manufacturing confectionery on a small level from his home in Addington, Christchurch. As a small business owner, Whittaker was essentially a one-man band, splitting his time between the product manufacturing process and door-to-door sales of his chocolates. In 1913, the business was moved to Wellington and James Henry established a partnership with his two sons, Ronald and James, to form J. H. Whittaker & Sons. The business prospered over the ensuing years and in 1931, Woolworths Australia established shops in Auckland, Wellington, Christchurch and Dunedin. Whittaker's was selected to be their main supplier of a wide range of confectionery, which proved to be a significant boost for the company. In July 1937, the business was turned into a limited liability company. The Whittaker's family has proudly continued to own and cultivate the business, driving it successfully into the twenty first century. Today the company is controlled by Andrew and Brian Whittaker, the third generation of Whittaker's owners. In 1969, Whittaker's moved its factory from central Wellington to the current location in Porirua. All of Whittaker's range is produced from the one factory and the products are distributed throughout New Zealand, Australia and Singapore. Although the Whittaker's factory is in Porirua, the very first step in making Whittaker's chocolate actually begins thousands of miles away in West Africa where the cocoa beans are grown. Whittaker's is the only major chocolate manufacturer in New Zealand that controls the whole manufacturing process – from the smallest of cocoa beans to the tastiest of chocolate bars. Whittaker's are proud of their premium quality chocolate, and Ghanaian cocoa beans are selected because they are among the highest quality beans in the world. The cocoa pods are harvested and each contain around 20 – 40 beans nestled in white pulp. The beans are allowed to ferment for several days before a week of sun drying to remove excess moisture. The beans are then bagged and shipped to the Whittaker's factory in Porirua. From the New Zealand factory, the beans are carefully roasted and the characteristic chocolate aroma and colour of the Whittaker's chocolate starts to develop. Roasting also loosens the outer hulls and the husk of the bean so that they can be separated easily. The beans are then cracked and the hulls blown away – a process called winnowing. The nibs (the inside of the beans) are carefully blended to form the characteristic Whittaker's chocolate flavour. The cocoa nib is then ground and heat pressure is applied, causing the cell walls to break down, melt and produce a liquid chocolate. This occurs because the cocoa bean is approximately 50 per cent solid (cocoa liquid) and 50 per cent fat (cocoa butter) so when the nib is ground, it turns into liquid. The next stage is refining. Cocoa butter, sugar and milk powder (for some recipes) are added to the liquid chocolate. The refining process crushes the particles to micron size, improving the texture of the chocolate. The resulting product is then ready for the last stages of production, transforming the cocoa beans into Whittaker's premium tasting chocolate. The chocolate is tempered so that it begins to harden for its final stage of moulding. Poured into the Whittaker's mould and cooled quickly, the chocolate bar is removed and wrapped at a high speed. Automatic carton filling ensures an efficient packing operation. Whittaker's follow strict codes of quality control throughout the entire manufacturing process, ensuring that all products are of the highest quality and have that premium Whittaker's taste. Because of this commitment to quality control, Whittaker's has developed into a major New Zealand chocolate company. Consumers have come to recognise and appreciate the quality of Whittaker's chocolate. Whittaker's is most famous for the Peanut Slab chocolate bar. This chocolatey, peanuty treat was first launched in the early 1950s in an unwrapped form and again in 1984 in its current wrapped form. The product has become one of New Zealand's most iconic brands and is still one of the best selling chocolate bars in the country today. In recent years, the Whittaker's range of products has expanded significantly. 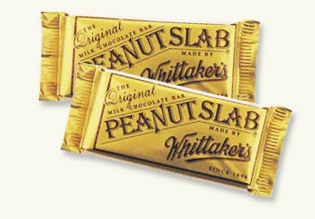 The Slab chocolate bar range has increased from the original Whittakers Peanut Slab to include a Raisin and Peanut Slab, an Almond Gold Slab and Hazelnut Slabs. More recently the Coconut Slab variety has been added. In a major move for Whittaker's in the mid-1990s, a 250-gram Peanut Block product was launched. This was quickly followed by the fruit and nut, hazelnut, creamy milk, almond gold and dark Block varieties. In subsequent years, further ranges have been added, including varieties of white chocolate. There are now 18 varieties in total and the development of the Whittaker's block range has been hugely successful. Whittaker's now hold a strong position in this very competitive market. The Whittaker's product strategy has also evolved into the premium end of the market with smaller pieces of chocolate, ideally suited for moments of relaxation with a cup of coffee or tea. The wrapped Sante products were launched in 2002 and have proved very popular for those moments when just a small piece of chocolate is needed. Unique to Whittaker's, the Sante products have become particularly prevalent with female consumers. Whittaker's Squares are the most recent addition to the range and again, these are new to the New Zealand market and ideally suited to complement a cup of coffee. The squares are 10.5 grams of premium quality chocolate and are each individually wrapped and presented in high quality packaging. Although the Whittaker's product portfolio has developed significantly, from the Whittakers Peanut Slab chocolate bar to the Whittaker's Squares, the individual product pack designs have all retained the brand's clear identity and heritage. The colour gold has become synonymous with Whittaker's and the brand's distinctive lettering style has allowed for Whittaker's products to have a unique identity on supermarket shelves laden with competitive products. During the recent wave of product additions, changes and developments, Whittaker's have kept their commitment to producing high quality, premium tasting chocolate. The continued success of the brand confirms that consumers appreciate the dedication that goes into the production of Whittaker's chocolate and its premium taste. Through controlling the whole process – from bean to bar – consumers are always delighted with Whittaker's chocolate. 1896 Company founded by James Henry Whittaker in Christchurch. 1913 Company moves to Wellington. 1937 Whittaker's becomes a limited liability company. 1950's Whittaker's Peanut Slab chocolate bar is launched. 1969 Company moves it premises to Porirua. 1984 The wrapped Whittaker's Peanut Slab chocolate bar is launched. 1992 Whittaker's Australia is launched. 1996 The Whittaker's 250-gram block is launched. 2002 The wrapped Whittaker's Sante chocolate bar is launched. 2004 Whittaker's Squares are launched.